Whether you're looking to get away for a night, weekend or need to be in town for work we are the excape you're looking for. We offer nightly, weekly and monthly rates for RV camping. 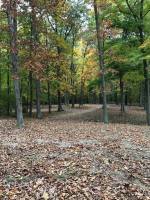 Tent camping is avaiable April through November. Scroll down to check rates. No more than 4 adults or 6 people permitted on each site. Check In at 1:00 p.m. & Check out is NOON. 1 VEHICLE MAX PER SITE. Any additional vehicles can be parked at the game room parking lot. Most of our sites are full hookup and have both 30 and 50 amp electric. 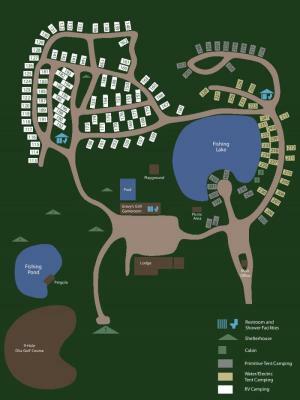 Check out our park map for details. Picnic tables & fire rings are on a first come/first use basis. Our showerhouses are closed for the season! They will reopen around April 1st. $650/month, plus electric. $150 cash/check refundable electric deposit upon move-in (credit card, if used, will be charged $10 service fee for deposit and for refund). All Monthly Memberships start the first of the month. We DO NOT PRO-RATE. You may pay the cheapest rate available for a partial month stay. (i.e. if daily or weekly rate is cheaper to get you to the first of the month that is what you will be charged). Call us for seasonal rates and additional information! Check In at 1:00 p.m.& Check out is NOON. No more than 3 tents per site. Peak Season (5/26-9/23) $36.00/night w/2 people Additional people = $10 per person per night Shoulder Season (9/23-5/25) $30.00/night Up to 6 people Camping includes admission to Water Park (Memorial Weekend - Labor Day) with properly signed liability waiver and weather permitting, pool, fishing, disc golf, & free activities (some activities have a small supply charge). Cancellations made within 7 days of your stay will incur a $35 cancellation fee. Peak Season (5/26-9/23) $39.00/night = Tent site w/2 people Additional people = $10 per person per night Shoulder Season (9/23-5/25) $35.00/night = Tent site up to 6 people Camping includes admission to Water Park (Memorial Weekend - Labor Day) with properly signed liability waiver and weather permitting, pool, fishing, disc golf, & free activities (some activities have a small supply charge). Cancellations made within 7 days of your stay will incur a $35 cancellation fee. Not into Roughin' It - that's okay, these two campsites are built just for you with a cabin ready to provide those certain "luxury's" so many of us can't relax without. 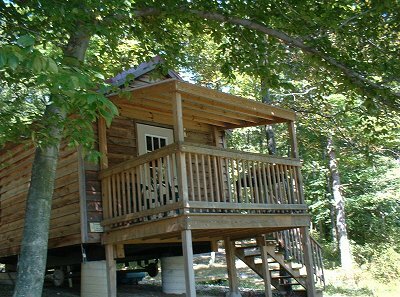 Our lakefront sleeper cabins are the perfect accomodations for any camping getaway. Cabins are available May 1-October 31. $100/night plus tax includes 2 People Two night minimum stay Add a Person- $15 4 adults max. 6 people max. $35 cancellation fee when cancelled within 7 days of stay. $75/night plus tax includes 2 people Add a person- $15 plus tax 4 adults max. 6 people max. $35 cancellation fee when cancelled within 7 days of stay. Reservations are typically necessary, cabins rent out very quickly. Not into Roughin' It - that's okay, these two campsites are built just for you with a canvas belle tent ready to provide those certain "luxury's" so many of us can't relax without. 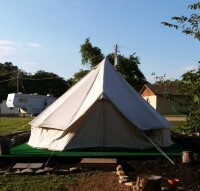 These glamping tents are located on sites 118 & 119, directly across street from RV bathhouse. Our Glamping Tents are the perfect accomodations for any camping getaway. Glamping Tents are available May 1-October 31. Your rental Includes: Full Bed (Site 118), Queen Bed (Site 119), Futon, all bedding, Air Conditioning, Heater, Lighting, Mini Fridge, Microwave, Bundle of Firewood, Full use of Park Ammenities (Water Park - Memorial Weekend - Labor Day weather permitting & with properly signed liability waiver), Fire Ring w/ Grill Top, Table and Outdoor Seating. $85/night includes 2 People Two night minimum stay Add a Person- $15/night 4 adults max. 6 people max. $35 cancellation fee for all cancellations made within 7 days of stay. $65/night includes 2 people Add a person- $15/night 4 adults max. 6 people max. $35 cancellation fee for all cancellations made within 7 days of stay. Reservations are typically necessary, glamping tents rent out very quickly.